Rice husks are waste products and recycling them could improve soil physical, chemical and biological properties thereby enhancing their productivity. Rice production in Abuja, Nigeria often requires mineral fertilizers in the form of NPK. 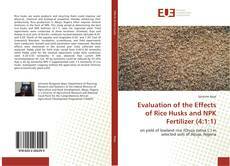 This study aimed at determining the best rice husks and NPK fertilizer (4:1:1) rates for improved yield. Field experiments were conducted at three locations: Kilankwa, Kuje and Kubwa in acid soils of ferralic cambisols located between latitudes 8.25° and 9.20° North of the equator and longitudes 6.45° and 7.39° East of Greenwich Meridian. Incubation, screenhouse, and field experiments were conducted. Growth and yield parameters were measured. Residual effects were monitored in the second year. Data collected were analyzed. Paddy yield for field trials varied from 0.40-6.40 tonnes/ha while Paddy yield for the residual experiment under field conditions were 0.20-5.93 tonnes/ha. It was observed that current NPK recommendation for rice, 90 kg tonnes/ha could be reduced by 33.33% that is 60 kg tonnes/ha NPK if supplemented with 7.5 tonnes/ha of rice husks. Subsequent cropping without the application of mineral fertilizer gave economically good yield.